AAP stands for the Aam Aadmi Party, which is a recently formed political party in India. 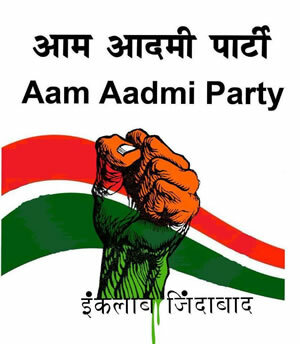 The Aam Aadmi Party, or AAP, as it is popularly known, is a newly formed political party in India. The party was formally launched by its founder Arvind Kejriwal and deliberately so on 26th November 2012, as the Constitution of India was adopted on this very date in the year 1949. Hence, this date is considered as being important despite the Constitution not coming into effect until 26 January 1950. Many people associated with the AAP, be it their supporters, volunteers, caretakers, members, or its founder Kejriwal himself firmly believe that AAP’s birth is a direct consequence of the nationwide agitation against the UPA government for the Jan Lokpal Bill. In the years 2011 and 2012, Kejriwal along with Anna Hazare, a hugely respected social activist, orchestrated a nationwide non-violent campaign against corruption as a whole, the corrupt political system of India, and even the corrupt politicians of India. Also associated with this campaign were other prominent social activists such as Kiran Bedi, Medha Patkar, Shanti Bhushan, etc., who came out in support of Anna in his fight against corruption. Basically, this movement was a non-violently sustained attack on the corrupt political system and politicians of India. The movement was corroborated by hordes of people everywhere across the length and breadth of India. It was for the first time after the country’s independence that such a mass public movement had taken place. Scores of people participated in rallies organized at every nook and corner of various cities and towns of India. People also thronged various monuments of the country like the India Gate in Delhi, the Gateway of India in Mumbai, for staging candle light protests or a protest march in the vicinity. The movement’s pillar of strength was Anna Hazare, who declared a fast unto death, or fasting till the government’s public acceptance of Jan Lokpal and its immediate implementation. Finally, the government had to accede to the demand of the nation as a whole for the Jan Lokpal, for which it decided to take effective measures. However, the talks that followed between Team Anna and the UPA government were of no great consequence, as there seemed to be some sort of an impasse between the two. Relentless in his pursuit, Anna declared to fast again and did so, but a major part of the movement appeared to have fizzled out. 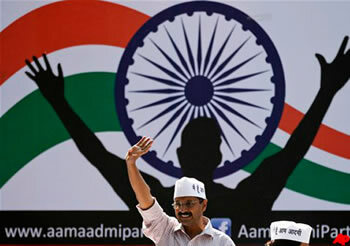 Soon, speculations were rife that there were factions in Team Anna and their movement against corruption. Reportedly, Anna and Kejriwal didn’t see eye to eye over the issue, as the later opined that direct political involvement is an imminent necessity, while the former was in no mood to sway away from apolitical campaigning. As expected, Arvind Kejriwal went on to form his own political party, which is the AAP, and Anna chose to stick to his guns, which were political non-involvement and mass-campaigning. Since its formation, the AAP took up a favorable stance in the political minefield, which is that of championing the common man of India. AAP’s rival parties saw this as a temporary affiliation and termed it as ‘primetime’ politics. However, the AAP has managed to uncover many corruption scandals and has brought a string of them before the public eye. Some of the major scams that the AAP proclaimed are Congress’ nexus with industrialist Mukesh Ambani, the falsely inflated electricity and water bills in Delhi, Robert Vadra’s unseemly land acquisition, etc. The AAP publicly presented exposes like these time after time, which seemed to hold them in good stead and even enamored it to some fragments of the public. Of course, AAP’s contenders labeled these actions as political stunts to woo supporters and public, ahead of the Delhi Assembly Elections in December 2013. The AAP juggernaut had been on course during its first year of existence. With a steady stream of financial support coming in mainly from the NRI’s, i.e. Indians living abroad, AAP managed to create quite a stir because of its declaration to contest the Delhi Assembly Elections in December 2013. Several known figures from the fields of media, law, politics and social activism, etc. joined hands with the AAP during this period to become its members enroute to the elections, which was going to be AAP’s first major test of sorts. AAP relied heavily on modern tools of communication for communicating with the masses. Use of social media sites such as Facebook and Twitter saw an active participation by the common public in the affairs of the party. AAP facilitated an online membership option for people wanting to be a part of the AAP, which is still available. The AAP’s official website also holds a portal where people can voice out their grievances or anonymously tip the party about a wrongdoing in their constituency. Measures like these made AAP increasingly popular among the masses, which the party’s PR machinery called as an ‘impetus’ for their future endeavors. AAP was formally registered as a political party in March 2013 by the Election Commission of India. The party chose its election symbol to be a “broom”. The Delhi Assembly Elections of December 2013 served as the first major test for AAP. All eyes were on the AAP, and understandably so, as the debutant party had promised to address all the important concerns of the people once it came to power. Notably among these promises, was AAP’s pledge to implement the Jan Lokpal Bill within 15 days of coming to power. The elections were duly held and the results were surprising indeed. Congress which was led by the Delhi Chief Minister Sheila Dixit could manage to win only 8 seats, while the AAP won a total of 28 seats. The Bharatiya Janata Party and its allies won 32 seats, which meant that no party won the majority of full 70 seats that were needed to go on to form a government on their own. As a result, the assembly was hung, but the AAP managed to form a minority government with conditional support from the Congress. Arvind Kejriwal was sworn in as the new Chief Minister of Delhi. The AAP has often been in the firing line for a variety of reasons. Firstly, the formation of the party itself has been a contentious issue, with many of Kejriwal’s former aides like Kiran Bedi going against him. The core group of AAP has also been criticized for promoting nepotism in their ranks, besides allegedly acquiring money from a number of untraceable sources. Furthermore, a sting operation conducted on several AAP leaders including Kumar Vishwas and Shazia llmi landed the AAP in murky waters. The video recording of this operation reportedly depicts the AAP leaders promising to extend their support for exchange of an agreed amount of money to be donated to the party fund. Lastly, Kejriwal himself has been accused of aggravating matters by making a mountain out of a mole hill over petty issues. In conclusion, it’s absolutely undeniable that the AAP has made heavy weather of situations going against them. However, situations like these have featured far too infrequently in AAP’s history to raise questions on its apparently clean and helpful image. AAP could be said to hold a firm footing in the political fray of India if it can successfully translate its Assembly election success to success in the Lok Sabha general elections of 2014.